OK, so you’ve budgeted between $50 and $100 for a few moto-friends, you’re strapped for time – and you want to attend your local International Motorcycle Show. Well, you’d be amazed how much cool, bargain-priced gear you can find in the last 45 minutes of the day at an IMS event. (That way you can spend the rest of the day ogling all the new hardware on display at the manufacturers’ display areas.) Let’s just say that we understand how that could happen. So, with time ticking down, our mad dash to find a selection of MO-worthy gift ideas illustrates that you can have your cake (seeing next year’s bikes) and eat it, too (taking care of holiday shopping). And if some of the frosting (accidentally purchased items for yourself) just happens to end up in your gear bag, that’s OK, too. Remember, the prices listed here are show prices and often contain a discount off the retail price – sometimes a very significant discount. So, you might end up looking like you spent more money for your present than you actually did. We’d call that a win-win! We’ve listed these products in the order in which we encountered them on the show floor so as not to play favorites. We reviewed the Grip-N-Ride back in February, and it turned out to be a simple and effective way of allowing passengers to hold on the rider more securely. 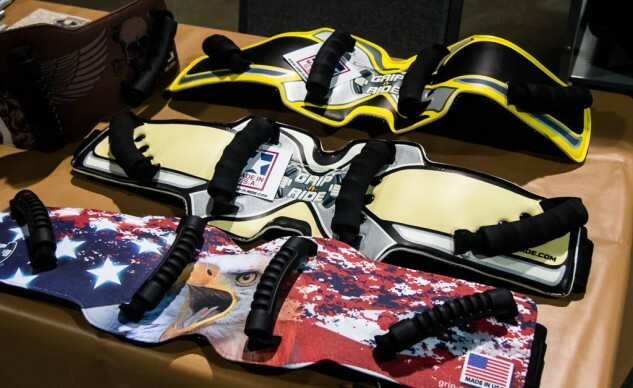 At the Long Beach IMS, the base model Grip-N-Ride was on sale for $50 (a $39 savings) and the Street Art Collection weighed in at $75 (more than half off). These kidney styled belts offer four handles for your passenger to grab ahold of you and stay securely in place out on the road. Learn more at grip-n-ride.com. Motorcyclists are well aware of the benefits of the electric vest (Venture Heat sells those, too), but the idea of heated insoles for our boots…well, that’s the stuff of fantasies on a cold winter day. The insoles are powered by your motorcycle’s electrical system, meaning you’ll be warm no matter how long you ride. The supportive soles are wired with ultra-thin micro-alloy fiber heating elements which are positioned throughout. 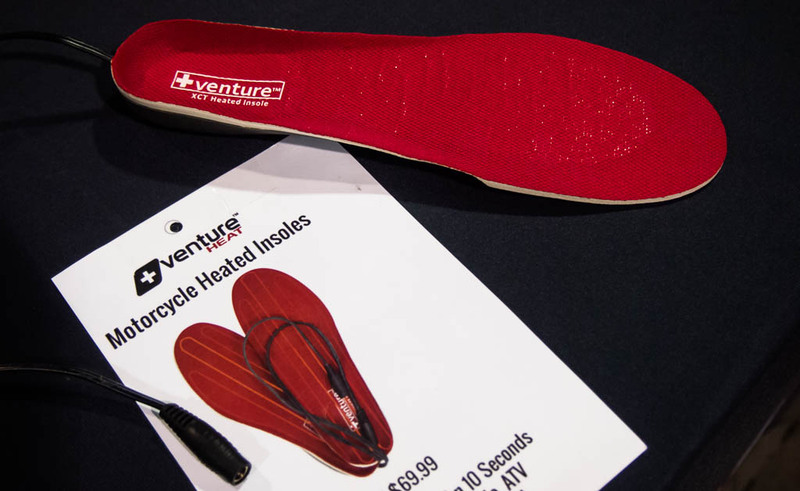 Claimed to heat, on demand, in just 10 seconds, while the adaptive, form-fitting memory foam ease your every step, these insoles are available at IMS events and online for $70. They can be hooked together with your other electric riding gear. MO staffers are big fans of Sena products. You’ll find a few reviews here. As good as the Bluetooth helmet communicators are, sometimes it isn’t convenient to take your hand off the grip to accept an intercom request or adjust volume. 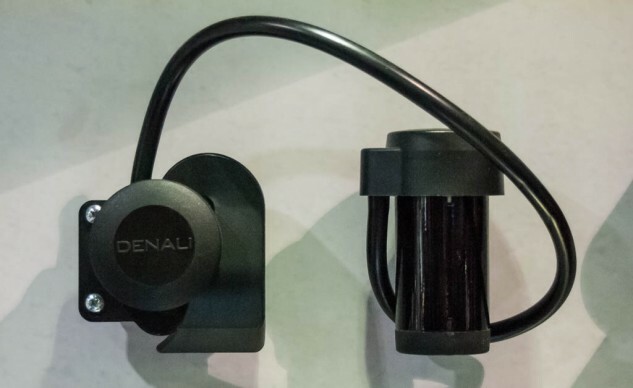 To solve that problem, Sena has created the Handlebar Remote which allows you to perform functions that would normally require you reach to the side of your helmet – only now with your hand taking care of business on the bike. For those who ride more than one bike, the Handlebar Remote can easily be moved from bike-to-bike in seconds. 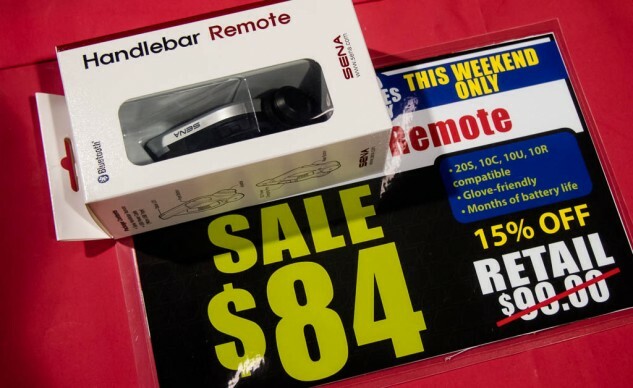 If you use your Sena headset every day, you should take a look at this product. We found this on sale for $84 in the IMS vendor area, and you can buy it from the Sena website for $99. Even the most dedicated rider parks their motorcycle occasionally and, consequently, will need a cover. Nelson-Rigg has a reputation for producing quality covers at a wide range of prices. While the company usually only sells through distributors, folks attending IMS events can score a 20% discount on Nelson-Rigg’s luggage, covers, and rainwear directly from the manufacturer. So, that means that the Falcon Defender 2000 cover that normally retails for $96 can be purchased for $77. The Deluxe All Season Cover that retails for $53 drops to $42. The same applies to their luggage and rainwear. Take a look at what the company offers at its website. So, you say your long rides are leaving you chafed and irritated? Perhaps you need to upgrade your underwear. Moto-Skiveez has taken the practice of placing padding in high contact areas of a rider’s nether regions that is so common in the bicycling world and adapted it to motorcycling. Even more impressive is the creation of three different Skiveez designs for three styles of motorcycling. Sport, Adventure, and Cruiser Skiveez consider the location of the bulk of a rider’s weight when placing the padding. The pads themselves are infused with silver ions to prevent bacterial growth while the rib shapes help to ward off chafing. 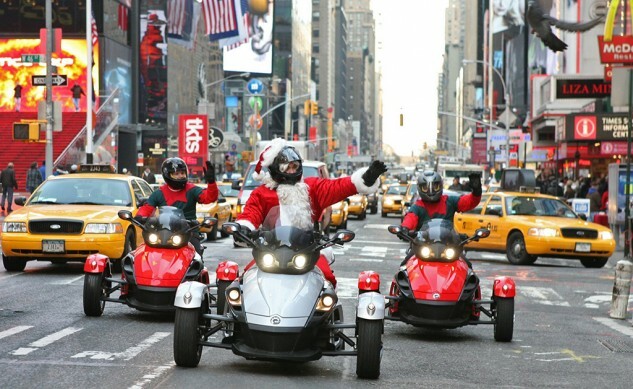 The padding is placed more forward for sport riders, while adventure and cruiser riders have the padding placed progressively rearward. Skiveez are available in sizes S–2XL for $60 at IMS shows or the Moto-Skiveez website. 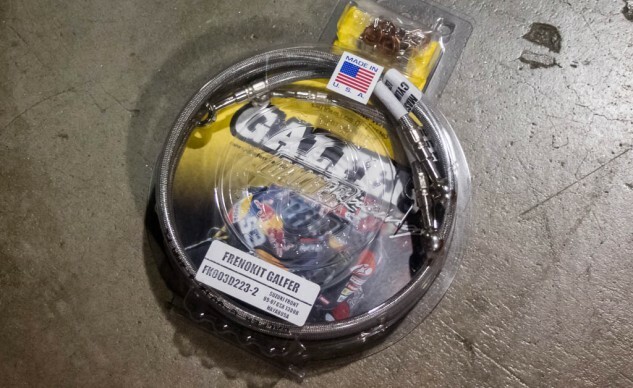 Stainless steel brake lines offer a sporty, custom look to any motorcycle while improving braking performance by preventing line expansion during hard stops. Galfer is an internationally known brake parts manufacturer and offers brake kits for most models of motorcycles on its website, but show-priced kits will most likely be limited to popular models. This kit fits ’99-’07 Suzuki Hayabusas and retails for $100 online and $80 in the IMS vendor area. Visit the Galfer website for more information. 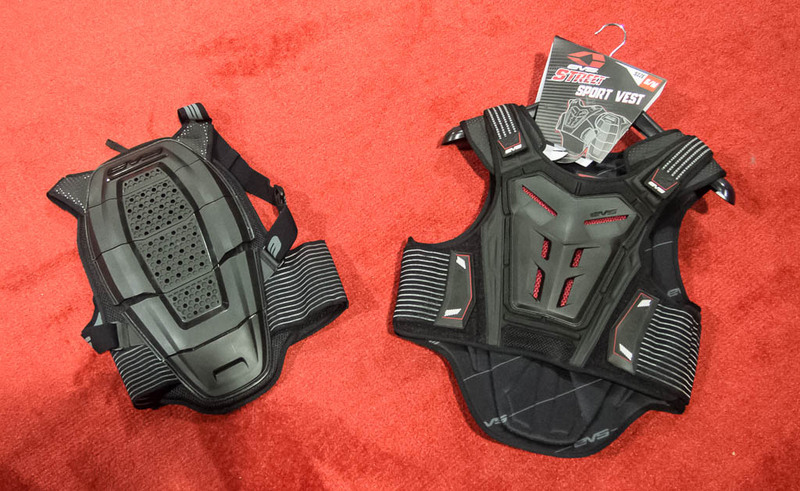 With the Sport Back Protector, EVS offers a CE-approved back for $89. For that price you get two layers of foam mounted to an articulated honeycomb shell. The foam is molded to allow for airflow, and the synthetic leather shoulder panels are perforated. The straps themselves connect via a sternum strap while a kidney belt-style compression belt holds the pad in place. The slightly more expensive Sport Vest applies the same protection to the rider’s chest, though the $109 price places it out of our price range for this gift guide. Find out more at evs-sports.com. 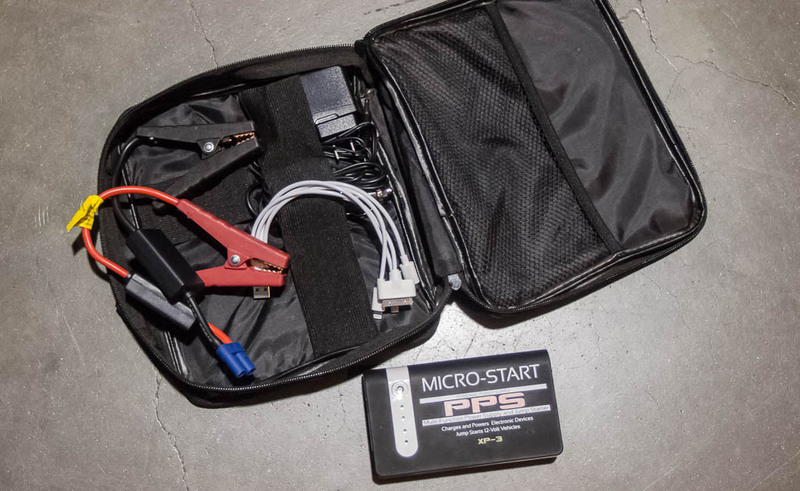 Apparently, lithium-powered motorcycle jump starters are becoming a thing. (We’ve got a test of one from another manufacturer coming out this week.) Antigravity Batteries had a wide selection of engine starters available at IMS, but the show price of $90 for the Micro-Start PPS put in squarely in our price range. Normally, you pay $130 for this 8000mah and 300 peak Amps of engine-cranking, electronic device-charging power. Even at that price point, the well-appointed kit – including cables for connection to vehicle batteries, a wide variety of devices (via included adapters), and a carrying case – claims to be able to jump start V–8 engines with the power contained in its 5.8 in. x 1 in. x 3.2 in., 8 oz. form factor. Learn more at themicrostart.com. 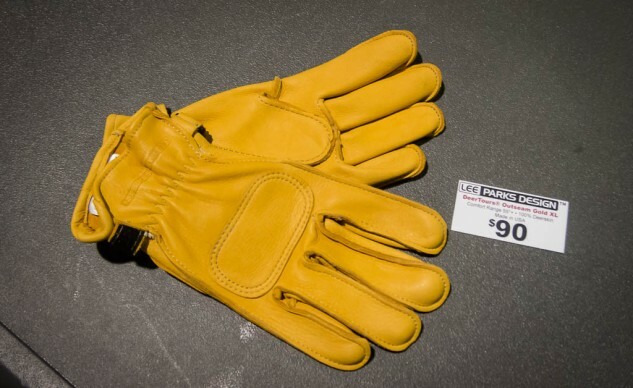 Deerskin gloves are known for their suppleness and abrasion protection, and putting the seams on the outside of gloves makes them even more comfortable. Lee Parks Design has combined the two in the Deer Tours Outseam Gold. With the classic design of roper gloves, the outseams prevent hotspots on long rides by placing the seams’ bulk away from the rider’s fingers. Additional layers of deerskin on the palm and knuckles provide abrasion resistance while the hook-and-loop closure keeps them on your hands in a tumble. The show pricing is $5 off the regular $95 retail price. Learn more at leeparksdesign.com. The best defense is a good offense, and a loud horn goes a long way towards being offensive when you need it. Twisted Throttle sells an impressive line of adventure touring-focused moto-products. The Denali SoundBomb Split Dual-Tone Air Horn puts 120 db of aggression just a button-push away for those times when you need to alert a zombie driver of your existence. The two-piece horn is designed to fit in the tight space requirements of motorcycles by keeping the compressor and the horn body separate. The SoundBomb retails for $55 and can be ordered at the Twisted Throttle IMS display. Find out more about Twisted Throttle here. 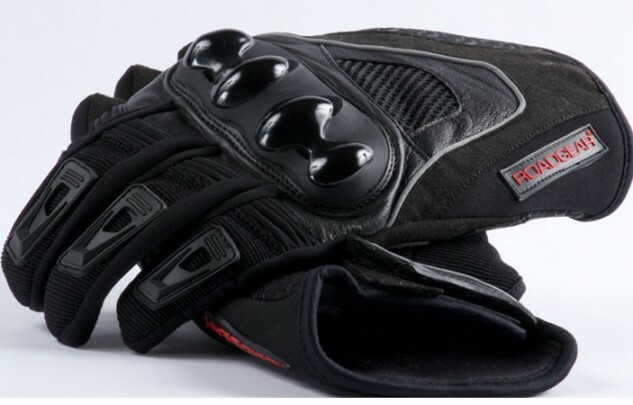 Roadgear started selling gloves in 1990 and has expanded well beyond just designing and selling gear for riders’ hands. 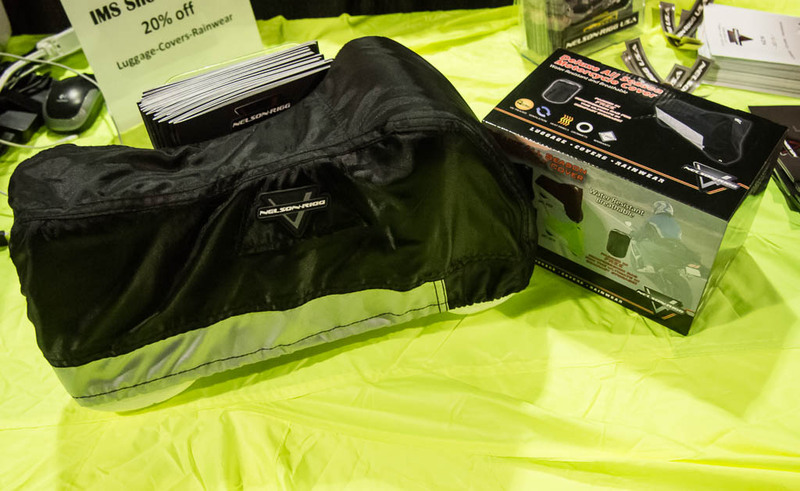 The AirMaxx glove settles in right at $50 and comes with features of more expensive items. Featuring abrasion-resistant silicone printed synthetic leather reinforced palm and a goatskin back, the AirMaxx includes perforated mesh on the back of the hand for ventilation. TPU hardshell armor protects the knuckles from impacts. The wide wrist opening and hook-and-loop closure make donning and doffing the gloves a breeze. Find more at roadgear.com.